ART OF TRANSIT: Guess where this photo was taken! Answer after the jump. Photo by JACKIE.LCK, via Flickr creative commons. President Obama wants to use royalties from oil and gas drilling on offshore oil fields to help fund research into vehicles powered by clean fuels. But political resistance is expected from some House Republicans who have been critical of spending on non-traditional technologies when it comes to vehicles. Separately, the National Academy of Sciences released a report on Monday saying that an 80 percent decline in greenhouse gas emissions from vehicles in the U.S. is possible by 2050 but it’s going to take a lot more than simply upping fuel economy standards, which President Obama already did. Specifically, the Academy recommended more rebates for those who buy clean vehicles and greater gas taxes on those who buy inefficient vehicles. There are still some restrictions in place, but the agency that runs heavy rail trains in the Bay Area wants to try to accomodate some cyclists who either have been wanting to use the train to help with their commute or, in some cases, have been ignoring the ban. As readers here likely know, Metro lifted its peak hour ban on bikes in 2011. The Victorville-to-Las Vegas bullet train, now called XpressWest, is hoping to get a $5-billion-plus federal loan to fund building the project. Not so fast. Two key Republicans in Congress — Rep. Paul Ryan and Sen. Jeff Sessions — are now urging U.S. Transportation Secretary Ray LaHood to reject the loan application, saying the loan is too risky. The XPressWest project needs the federal loan to get more private investors. In related news, Ryan’s proposed federal budget for the 2014 fiscal year would end all spending on high-speed rail projects, which would be very problematic for California’s fledgling project that aims to eventually connect San Francisco, Los Angeles and San Diego. Los Angeles Councilman and Metro Board Member Jose Huizar traveled to the nation’s capital last week to meet with members of Congress and other federal transportation officials in an effort to secure federal funds to build the downtown Los Angeles streetcar project. The city of L.A. will be applying for a federal Small Starts grant to help pay for half of the $125-million project. This will be an interesting process, as many other cities have asked for similar grants for their own streetcar projects and Metro, of course, is pursuing a federal New Starts grant to help pay for the Regional Connector and Westside Subway Extension, two projects that extend the reach of transit in downtown Los Angeles. The key question is in a time of federal belt tightening — thank you, sequester — how much federal funds can the region expect? For what it’s worth, I hope everything here gets funded. The more layers of transit, the better. 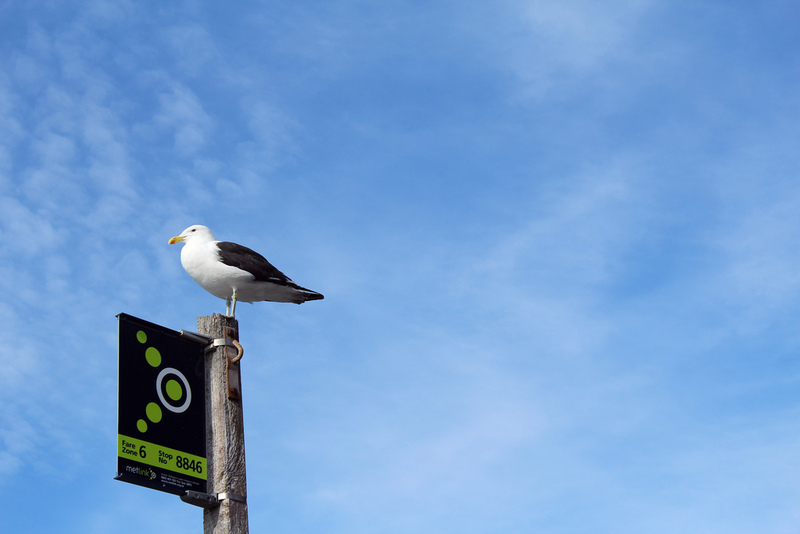 The sea gull photo was taken in Wellington, New Zealand. Service alert: night-time tunnel cleaning this week in downtown Los Angeles subway stations after 8:30 p.m.